COLQUITT, Ga. — Hurricane Michael damaged many homes and businesses in the area, including one Colquitt favorite, Cafe LeLe. It’s been six Months since Cafe LeLe has opened its doors to the public, six months since guests have been able to enjoy Cafe LeLe's fresh food, coffee and ice cream. Like many homes and businesses, Hurricane Michael ripped the roof off of the building, resulting in electrical and flooring damage. Gil Kelley and his wife, co-owners of Cafe LeLe, have felt the impact from the closure the hardest, but the community is also missing this hometown favorite. Despite the closure, there is hope. "We're still going to be open by Friday. It's actually our sixth anniversary date on that Friday that we opened up six years ago," said Kelley. "We're down to the nitty gritty on the lighting. We've got a couple of days we've got to get out and find it." In addition to new lights, Kelley also needs to do another check of the equipment, be inspected, and order food. 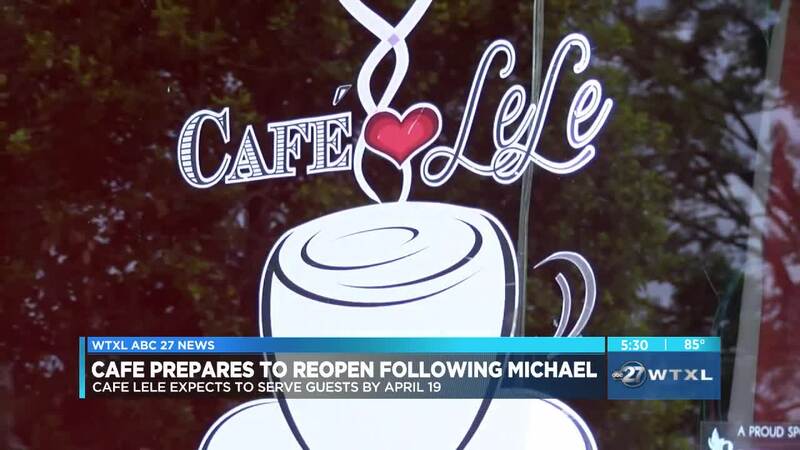 It’s been six months since Cafe LeLe was forced to close, but the owners and staff are excited to reopen and serve the community once again for years to come. Cafe LeLe’s reopening is also the weekend of Colquitt’s annual Mayhaw Festival, which draws in hundreds from all over.